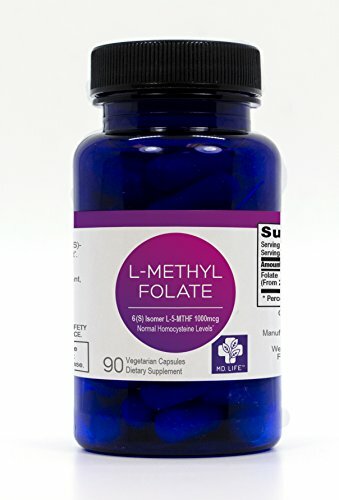 Optimized Folate (L-Methylfolate), 1000 mcg, 90 vegetarian tablets. Folate is involved in neurotransmitter synthesis and critical enzymatic reactions throughout the body. By depleting excess homocysteine, folate benefits cardiovascular health and nervous system function. Those who take ordinary folic acid supplements, however, may not be experiencing its full spectrum of effects. This is because once ingested, not everyone converts folate to its biologically active form called 5-methyltetrahydrofolate (5-MTHF). Research shows that in a large proportion of the population, genetic enzyme deficiencies prevent the conversion of folate to 5-MTHF, leaving many vulnerable to low blood folate levels (and higher than desired homocysteine). A more useful approach is to take the bioactive folate 5-MTHF directly, which has been declassified as a drug and is now available as a dietary supplement. 5-MTHF has been shown to dramatically raise blood serum folate levels compared with folic acid supplementation. This bioactive folate is up to seven times more bioavailable than folic acid. This greater bioavailability is especially important in people who have a genetic enzyme deficiency since it requires no conversion to become metabolically active. Physician formulated in GMP facility for maximum absorbtion. Excellent source of folate for pregnant women and women of childbearing age. Aids in formation of healthy red blood cells. Supports healthy nerve and heart functions. If you have any questions about this product by MD.LIFE, contact us by completing and submitting the form below. If you are looking for a specif part number, please include it with your message.